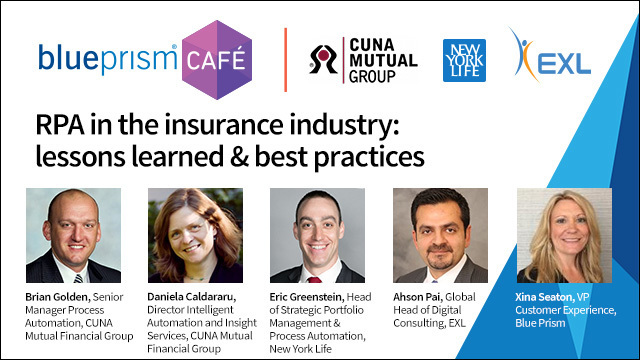 I recently had the pleasure of taking part in the latest Blue Prism Café, joined by thought leaders from New York Life Insurance Company, CUNA Mutual Financial Group and EXL, where we discussed best practices for Robotic Process Automation (RPA) with a live audience. In this special episode on the insurance industry, we highlighted why and how to implement a Digital Workforce and what best practices organizations can share to make RPA a long-term and scalable solution for their business. This blog encapsulates key insights from that conversation. Enhancing the customer experience and delivering greater value is now the top strategic priority for businesses across the globe - as revealed by EXL’s joint survey with Harvard Business Review Analytics Services. This is especially true for the insurance sector, where customer expectations are rising, creating an impetus to generate innovative ideas to meet these needs - while simultaneously driving down operating costs. For example, Lemonade offers a three-second insurance claim payout and Metromile delivers a pay-per-mile car insurance for the modern driver. The problem is that the digital technology innovation that enables these great ideas needs to work well, but the joint survey also reveals that two-thirds of companies aren’t seeing significant results from their digital transformation programs. The good news is that by embracing RPA, insurance companies have opportunities to leapfrog generations of technology advancements – and bypass the challenges of enterprise-wide implementation. Through automating back-end processes such as claims processing, underwriting and providing policy quotes, innovative companies are now driving end-to-end transformation and positively impacting the customer experience. Enhanced customer experiences by creating the ability to re-focus on service value. Improved work experiences and increased productivity by reducing the dependence on labor-intensive, manual tasks performed by employees and re-aligning human capital on strategic activities. Less cost required to scale and support projected growth, and reduced talent acquisition expenses. Higher data quality achieved by eliminating human errors, and the ability to capture process data consistently. Revenue uplift enabled due to faster product development and addressing missed revenue opportunities. Cost optimization achieved by increased capacity from automating activities that don’t add value. First, we established the basic infrastructure and selected the Blue Prism RPA platform. Next, we defined the rules and governance structure. Finally, we enabled the supporting processes. We also identified and generated a heat map of RPA opportunities to immediately impact outcomes, and looked to minimize manual processes and reduce the potential for human errors while ensuring seamless RPA integration within multiple disparate applications. Four pilot automation programs were identified that included investor accounting reconciliation, the tax withholding process, accounting and controllership – manual journal entry and management reporting – and asset management income statement. This enabled the team to experience RPA across a wide range of operations across the business. These efforts have yielded meaningful business benefits for New York Life including significant cost savings, reduction in tax withholding processing time and gains in resource capacity in investment accounting reconciliation. The team has also experienced significant time savings for accelerated throughput at lower costs, scalability to support organizational growth and increased transactional volumes. Additionally, employees being re-focused onto higher value tasks has led to productivity increases through optimized processes. New business - Improve straight-through processing and life insurance upgrades by combining Digital Workers, such as software robots, and social data to analyze patterns for refined underwriting strategy. Policy administration – Automate updates to personal bank details and reject or cancel policies with delinquencies by learning delinquency patterns. This can help insurers avoid policy drop outs. Claims – Automate FNOL submissions into various systems, and provide notifications to loss adjusters by continually assessing risk, predicting fraud and identifying thefts. Digital mailroom operations - Utilize optical character recognition (OCR) and intelligent character recognition (ICR) to digitize the hand written, semi-structured data to lower the cost of paper-based customer interactions. Cognitive virtual assistants – These can improve customer experience while lowering cost of operations and acquisition across voice, chat and social media channels. Ultimately, for those insurance organizations new to RPA, the key challenge going forward - to ensure that longer term gains are achieved, is opting for a collaborative RPA platform that can be run by business users - while operating within the full governance and security of the IT department. Done well, RPA is a compelling route for insurance companies to swiftly achieve business-led, digital transformation that can significantly improve the customer experience. This assertion is based on EXL’s recent assessments and implementations at a large insurance company. Benefits experienced range from a 30% FTE reduction, reduced operational, financial and audit risk – as well as greater scale and resource capacity achieved back to the business.